Israeli-Arab Muslim leader issues “call to arms” to stop Jews from praying on the Temple Mount. Sheikh Raed Salah is at it again. 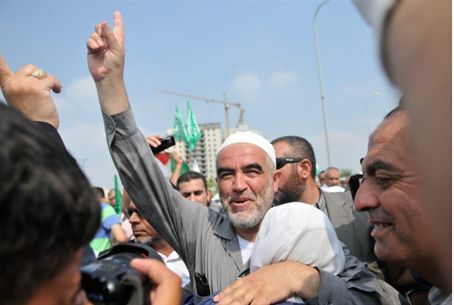 The leader of the northern branch of the Islamic Movement in Israel, who has previously called on Muslims to “liberate” Jerusalem and has preached against Israel in Be’er Sheva, called this weekend for Israeli Arabs to block Jewish access to the Temple Mount with their bodies. Salah warned his listeners that Israel is planning to “break in” to the Temple Mount, on which the Al Aqsa mosque now stands. He may have been referring to a recent statement from a police commander, who informed the Knesset that police will try not to restrict Jewish visits to the Temple Mount during the upcoming holiday season. Jewish visitors are allowed to tour part of the Temple Mount compound, but do not enter the mosque or the Dome of the Rock structure. Salah made another claim sure to enrage many of his supporters: that he has information indicating that Israel is planning to build a synagogue on the Temple Mount. He also claimed that Israel plans to institute the same system used at the Tomb of the Patriarchs (Maarat Hamachpelah) in Hevron on the Temple Mount, setting aside a part of the holy space for Jewish prayer on a daily basis. After warning of the alleged danger of increased Jewish prayer at the site, Salah called on Muslims from across Israel – from the Negev and Galilee, Akko and Haifa – to come prevent the “dangerous mass invasion into Al Aqsa” with their bodies. In the past, such statements have led the Israel Police to close the Temple Mount for Jews out of concern that Jewish presence at the holy site could be met with Muslim riots. The police policy of restricting Jewish access in order to maintain quiet has led to complaints of discrimination. The Temple Mount is the holiest place on earth according to Jewish tradition, and was the site of the First and Second Temples of the Jewish nation in ancient Israel.